The original plan was to use the citations bugfix/overhaul as a simple vehicle to show off the Vue integration, but this includes quite a few more notable bits from the journey. Adds support for using dependencies straight out of node_modules. This WILL NOT WORK for stuff require()d, but for components which are 100% bundled (as should be everything new), it's way cleaner and easier, and the right way to do it. Should fix #4906; replaces the bibtex lib with two separate components that are much more flexible and extensible. Adds axios (https://github.com/axios/axios) as an HTTP client. It's really, really nice. Adds two new application entrypoints, removing old 'require'-based entries for both the masthead and workflow editor. This ideally would have been a separate PR since it's a pretty big step forward, but it was a requirement for getting citations.vue working correctly. (basically, I managed to pick the most entangled component ever to use as a vue conversion example -- d'oh). This dramatically cuts down on the number of files fetched on older pages. Workflow editor load times, before, then after. Similar performance increases for data libraries, trackster, and circster. Bundling of libraries, trackster, circster as well as the aforementioned workflow editor, with similar performance gains. Libraries got cut down by about 80 requests, halving the time it takes to load. Swap to a more flexible bibtex library. Citations work; add client route, remove mako and make it all js-driven. …We're shifting *more* towards encapsulated components and having all this stuff split up makes it more difficult to wrangle. Vue lib+build; fixes setimmediate polyfill injection. Better, more robust latex conversion. Fix up admin apikey imports, formatting. Allow views *or* elements for panel display method. // TODO refactor into a reusable Vue component display mechanism. Which will make it easier to generalize later because you can just pass the component in, no need for template. Nice, trying that out now. and it is up to date. Please ignore if you can create a workflow or this issue is unrelated. Thank you! 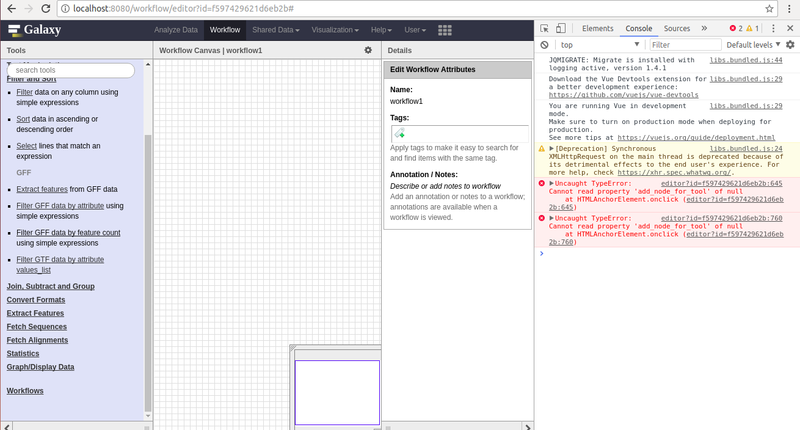 @anuprulez I had left out a bit of the refactoring related to the workflow globals handling, thanks! Works for me with the latest change. Add a tag to formatted references in citations.vue. No style associated with it yet but it makes it easier to identify for tours and tests. So, this is basically the opposite of addressing @jmchilton 's concern about complexity and additional libraries, but rather than making a comprehensive bib renderer ourselves can we use citation-js or something similar that uses the citation style language standard? Just to clarify - I was opposed to adding additional dependencies without getting some clear benefit. Not actually building a bibtex renderer ourselves would be a huge benefit (see commit message here for instance). Fair enough! Let's get out of this game. Let's get out of this game. ... as part of a subsequent PR so we don't block Vue even further on the citations point... right @jxtx? There is a horizontal gap before the citation is shown. Also the 'cite us' text is new, right? I am not a fan (it is probably not for me to decide though), however due to its color it is the most eye-catching thing on the whole toolform page which I see as problematic. Can we get rid of the console logs from vue? Also it seems we need to adjust the release process to accommodate for switching vue to production. 12:07:28.891 vue.js:8270 You are running Vue in development mode. It is whatever client-format did. I thought we abandoned extra spaces with regards to parens. The cite is text used to only be in the history wide view - where it looks better and makes more sense IMO. There you are summarizing a whole analysis and would expect many more citations and aren’t trying to take focus away from the tool. I wouldn’t include it in the tool form this way - I agree completely. Yeah, the text isn't new, but it seemed like a good idea this morning to standardize the (now trimmed down) info message. Seems less like a good idea in retrospect; I'll add the toggle back in. Only show citations infomessage blurb for the full history view. Slight reformatting in message display for history-level citations. Popped the message back off the toolform; only shows in the 'history citations' view, adjusted the structure slightly. 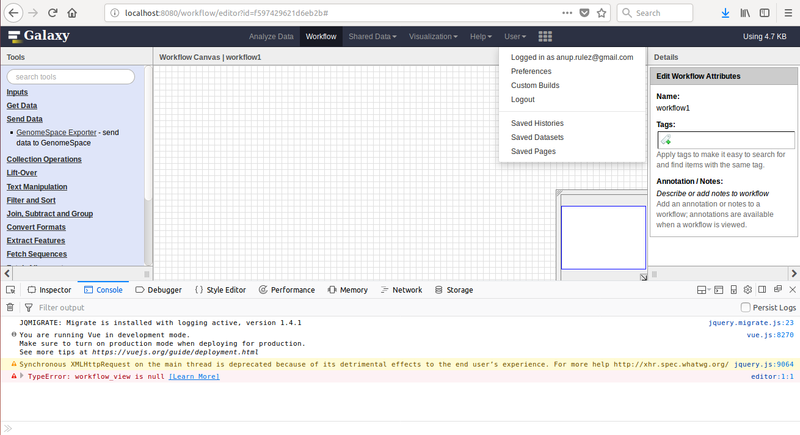 Vue devtools are working fine for me in firefox, not sure what's up on your end there. The bibtex.js file is because of a (now) untracked previously bibtex.js in your client libs. The charts issue is unrelated to this PR (broken in current -dev). I'll follow up with a fix separately.